Every Eagle Claw fish hook gives you maximum performance no matter what you're fishing for. 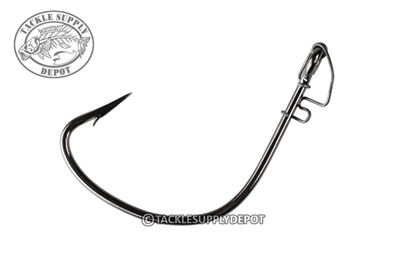 Elite Series Pro Shaw Grigsby collaborated with Eagle Claw to help design the Eagle Claw Shaw Grigsby High Performance Hook. The Eagle Claw Shaw Grigsby HP Hook features Lazer Sharp hook-point technology for the ultimate in penetration and strength. The Eagle Claw Quick Clip also holds your bait in place, preventing soft plastics from sliding down the hook shank. This hook is ideal for hollow tube baits and can be used in conjunction with Eagle Claw's Quick Clip Internal Tube Weights. Perfect for skipping tubes far back under docks and limbs to get the bass others are missing. Eagle Claw products have been trusted worldwide since 1925 and are the only fishhooks made in the USA.